Have you always wanted to learn how to paint? To bring out your creative side and express yourself as an artist? Help is at hand: A new 6 week term of morning and evening art classes will begin on Tuesday 10th and Thursday 13th January in Terenure in the South Dublin area. These exclusive lessons provides students with the best of painting tuition, clearly and simply imparted to novice and intermediate alike. These small workshops are held in the warm and friendly environment of my studio and everyone gets maximum attention. Over the 6 weeks, students will be encouraged and nurtured in a convivial atmosphere; so don’t be daunted! 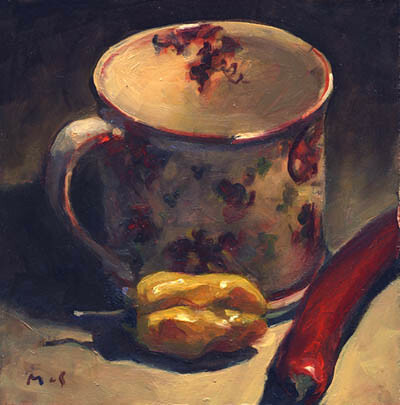 Still Life Painting: [Adults: All levels] Students will learn and practice drawing technique, preparation of canvases, technique, composition, colour-mixing and brushwork. Each session is 2.5 hours. ACI reserves the right to cancel classes if there isn’t a sufficient number of students. Please enquire about nearest start date on 086 247 0737. Full payment ensures place. Address: The Studio, 17 Aideen Avenue, Terenure. Dublin 6W.